by Stacie Vaughn Hutton (Author) and Cheryl Harness (Illustrator). Meggie Gwinn loves dreaming about faraway places, but one day her dreams are gone. With the help of her coal miner daddy,Meggie learns of all the Gwinn dreams that have come true and the family message that would triumph over danger and darkness. Generations of families have endured sacrifice and hardship in hopes they may leave a better world for their children and grandchildren. 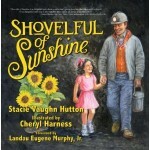 From letters written by coal miners, author Stacie Vaughn Hutton writes a story of hope and inspiration by showing how a young girl copes with her father’s job as a coal miner. Illustrated by renowned children’s book illustrator, Cheryl Harness, this book will be a family treasure for years to come.